The Intumescent Fire Seals Association is pleased to announce the introduction of Associate Membership for installers of intumescent sealing products. For over three decades IFSA has been active in developing test standards for manufacturers of intumescent seals, and in informing professionals and public as to the benefits of using quality products to achieve an assured level of passive fire protection performance in the built environment. Now we seek to educate companies engaged in installation activities – those that take approved products from the manufacturers and apply them on behalf of the end users – by providing appropriate advice on their application. Associate membership status is open to companies whose services are certified by an approved body, such as IFC Certification, and involves an initial review procedure followed by an ongoing requirement to undertake annual product awareness training provided by members of the Association. Product standard EN 16034 has been published and so it will soon be possible for manufacturers of fire resisting doorsets to CE Mark their products. Doorsets will be able to be CE Marked from the date of publication of EN 16034 in the Official Journal of the European Union (OJEU); this is anticipated to be mid-2015. The CE Marking of all construction products is mandatory under European Regulation 305/2011 (Construction Product Regulation) for all products for which there is a harmonised product standard. When the citation of EN 16034 appears CE Marking of doorsets will still be optional, and will only become mandatory at the end of a yet to be defined transition period, which will be included in the publication in the OJEU. The transition period will be between one and five years. The Intumescent Fire Seals Association (IFSA) held its 33rd Annual General Meeting on February 24th, 2015.
express its views, and he made considerable contributions to its technical output. attending the meeting wished to acknowledge. In August 2014 International Paint Ltd’s Fire Protection division undertook a full scale fire test of a 6m slender steel rod under tensile loading with an applied intumescent coating. A bespoke tensile loading rig for use in a large floor furnace was designed by International Paints’ in-house Structural Engineers to permit this first ever test of its kind. 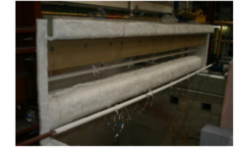 The fundamental aim of the investigation was to ascertain the need for a specific test of a rod in tension for fire protection product validation. Forthcoming international and European fire test standards are expected to benefit from the findings. Specifically, the test was designed to demonstrate that the strain developed within the fire protection material had no detrimental effect on its insulating performance. Furthermore, a series of unloaded sections were included to assess the influence of a number of factors relating to intumescent coating performance on rods, including curvature, section factor, etc. It was concluded that the imposition of a tensile load on a steel rod has negligible influence on the performance of a fire protection material in comparison to an unloaded rod and that therefore a tension test is therefore not required of industry. Despite localised deformation resulting in high strains the intumescent coating did not lose its cohesion prior to ultimate failure of the rod itself, which occurred as predicted in-line with structural calculations. A report has been prepared for the benefit of the fire resistance and structural engineering communities. A copy of the document and all raw data will be made available to those who request it. The members and the staff of the Secretariat of the Intumescent Fire Seals Association (IFSA) wish to put on record their sympathy and condolences in respect of the victims and their families that perished in the Lakanal House fire on 3 July 2009. The fire and the subsequent Inquest which finished on the Thursday before Easter (2013), identified the vulnerability of all of us to the effects of a fire, but it is even more poignant when it occurs in the home environment where we have the right to feel fairly impregnable to external influences. When it comes to deaths in any disaster, there are many factors that come into play and rarely can any particular factor be identified as the cause of injury or death. However, in the narrative accompanying the Coroner’s report on a number of the victims, two of the four points specifically referred to were……..
IFSA has striven for over 30 years to promote the life safety benefits of fire door seals (both for fire and smoke containment) and properly designed and installed service penetration and linear gap seals. The Association has recorded some successes in this area as there is definitely a growth in the installation of fire door seals and penetration seals in modern buildings. It has undoubtedly been more challenging to implement this enhanced technology in existing building stock, both commercial and domestic. Unfortunately, the 1971 Fire Precautions Act actively frustrated the upgrading of existing building stock by stating that if a product was suitable for purpose when it was originally installed, it continued to perform that function in perpetuity, regardless of any increase in knowledge and/or the development of new, safer, technologies. Intumescent sealing products, which revolutionised the effectiveness of fire doors and our ability to seal up holes provided for services, did not come into common use until the late 1970’s, hence, their benefits were denied to those refurbishing buildings after 1971 and, indeed, right up to 2006. At this time, the Fire Precautions Act was repealed in favour of the Regulatory Reform (Fire Safety) Order which required all buildings (except private dwelling houses) to be subject to a bespoke fire risk assessment by a competent person. Such a fire risk assessment has no product exclusions and it is up to the competent person to decide whether a building remained safe for the occupants without the adoption of modern improved fire sealing products. Unfortunately, without the power of legislation, IFSA cannot enforce the adoption of the recommendations contained within these documents and patently the information did not reach the eyes or ears of those responsible for the fire that resulted in this particular tragedy. Hopefully, however, the public reactions to the Lakanal disaster will mean that residents in other dwellings may now benefit from the recommendations that IFSA has made in these guides. Fortunately, the IFSA recommendations are not expensive to adopt and are generally simple to install, unlike fire suppression systems and so significant improvements in fire containment and its associated life safety benefits can be achieved quickly and in a cost effective manner. The recent publication of a Determination by the Department of Communities and Local Government (DCLG), regarding fire safety level in a hotel, raises many issues that are critical to the role of passive fire protection in buildings, especially to those serving the fire door industry. The Determination arose after the enforcing authority carried out its requisite review of the hotel’s fire risk assessment, prepared by the Responsible Person’s nominated Competent Person under the Regulatory Reform (Fire Safety) Order 2005. The local authority, when reviewing the Fire Risk Assessment, as it is mandated to do so under the Order, found anomalies in respect of the assessor’s treatment of the need to fit fire and smoke seals onto bedroom doors. The need for seals was contested by the hotel’s Responsible Person and so the CLG were approached to adjudicate on the matter by way of a ‘Determination’. The findings did not make happy reading for the suppliers/installers of passive fire protection and for the fire door and fire door seal manufacturers in particular, or did they? From the fire seal suppliers’ point of view, the people involved in making the Determination demonstrated that they really had little appreciation of the function and benefits of smoke seals and fire seals. Several times in the Determination it talks about, ‘the smoke seals providing increased protection from the spread of smoke in the early stage of a fire and the provision of intumescent seals have been shown to improve the fire resistance of doors’, keeping the two functions totally separate. This is flawed thinking because the benefit that intumescent and smoke seals provide is continuous protection that provides smoke control across the whole period of fire attack. Intumescent strips have made a major contribution to restricting the flow of smoke from the 10th minute to the 60th minute, or more, as anybody who has witnessed a test on fire will attest. It is possible to increase the duration for which the smoke seal remains effective by formulating the seal material to resist higher temperatures, but as the requirement is only to control ambient temperature smoke, this must never be assumed. Fortunately, after the first 5 to 10 minutes the intumescent seals become activated and take over the smoke sealing role which they maintain until the end of the duration for which the door is meant to resist fire. The lack of suitable test equipment means that it has not been possible to quantify the resistance to the spread of hot smoke provided by expanded intumescent at full size, albeit academic research in support of an MSc in fire engineering*(1) proved that it is possible and that the results were very encouraging. Omitting intumescent seals on bedroom and on cross‐corridor doors would result in a more rapid loss of tenable conditions in a similar manner to the smoke seals jeopardising the safety of the occupants. The tone of the Determination was that fire doors without seals were accepted as being adequate several decades ago, i.e. under the requirements of the 1971 Fire Precaution Act and by inference should still be acceptable in 2011/2012. This concept was, in fact, the very principle behind the ‘statutory bar’ whereby persons responsible for operating certificated buildings did not feel obliged to keep updating their building standards. Effectively, the ‘Crown’ indemnified these owners against the need to keep reaching ever higher standards. However, setting of acceptable levels of fire safety is not the responsibility of the owner (the Responsible Person) but it the responsibility of the competent person as he has the ongoing insurable responsibility for the safety of the property. Is the competent person willing to put his reputation and professional indemnity insurance behind the safety levels enshrined in 40 year old legislation? IFSA suggests that in the event of a fire tragedy occurring in premises for which the fire risk assessor is responsibly, any inquiry would find it hard to understand why the assessment failed to recommend the adoption of equipment that provides higher levels of fire safety. Members of IFSA would not wish to find themselves in that position. However, one of the most potentially dangerous aspects of not fitting intumescent seals is the fact that many types of intumescent provide essential structural benefits keeping a fire door leaf closed. In the case of unlatched doors, this is the only mechanism that holds the door shut after the door closer melts at around 10 to 14 minutes. What the Determination fails to recognise is that prior to the late 1970’s all unlatched door assemblies were fitted with floor springs which remained operative throughout a fire, keeping the door closed. The invention of intumescent seals which generated pressure changed all this and unlatched doors fitted with overhead closers, became possible and, indeed, preferred, for both financial and simplicity of construction reasons. Not fitting the correct type of intumescent on unlatched doors effectively means that the door will probably fall or be ‘blown’ open before 15 minutes have been reached. Unfortunately, such doors are normally those that feature in the construction of protected stairways, probably the most important part of any protected escape route because people are in the stairs for longer periods. Therefore, maybe the argument in favour of the use of seals has not been lost. The recommendation from the CLG was that the fire risk assessment should be carried out again, but this time the report should justify why the seals do not need to be fitted,…….. Is that an ‘easy’ task in the light of the above? Why should doors in hotels not need to prevent the spread of hot smoke (the most toxic), when restricting cold smoke will do? How do you justify not adopting seals with the benefit of more than 30 years product development, testing and refinement when we can omit the seal completely and revert to 1960’s level of fire protection, which experiments showed led to almost immediately smoke logging? Why do we need to keep unlatched fire doors closed when we could allow them to come open after 10 to 12 minutes? Maybe it is more difficult to justify the omission of fire seals than the CLG Determination suggests. Knowing how difficult it is to quantify the role of intumescent materials in the assessment of fire hazards is the very reason why IFSA has published a range of free downloads to help the competent persons make an adequate assessment of the risk. These are available [on this site/from IFSA] and perhaps the competent person(s) tasked with carrying out the new risk assessment may find them of some help with the new task because the issues are not as simple as the CLG may suggest. IFSA is pleased to advise that the latest version of the Guidance in Support of Building Regulations in respect of fire safety – Approved Document B, was published early in March. The first change is quite significant; it is the Approved Document B for England! After decades of England being extricably linked with Wales in the Regulatory sense, devolution is now very much in evidence. The industry became aware during 2012 that Wales had taken a tougher line over the use of domestic sprinklers in housing than we had in England, primarily because their devolved status allowed them to do so, but the publication of the 2013 Approved Document ‘B’ highlights how the two regions are departing in their principles. The main objective of the Approved Document for England is, of course, to enable easy adoption of the new European Construction Product Regulations; the CPR, which has to be implemented this Summer (2013). A by-product of this is that the Appendix A to Approved Document ‘B’ has had to acknowledge the existence and the need to adopt EN testing procedures in order to enable the adoption of the CE mark, when it is able to be granted, as demanded by CPR. Unfortunately, the opportunity to remove the term ‘fire-stopping’ in favour of ‘service penetration seals’ or ‘linear gap seals’ was lost and so, despite having bespoke European test procedures for these functions, we will continue to propagate the principle of ‘bunging-up holes with muck’. As a consequence, B3 continues to reference cementicious and gypsum based materials as being suitable for fire-stopping, despite their obvious inadequacies in many applications. Hopefully, the fire risk assessors, as a result of their auditing role under the Regulatory Reform Order, identify clearly where they consider that Approved Document ‘B’ listed materials are not able to contain fire to satisfactory ‘safe’ levels. To do this, the assessor will need to receive ongoing training in respect of fire sealing solutions if they are to have the necessary competence in accordance with the Competency Councils’ guidance. The AD’B’ was not the only revision made this month as the Approved Document to Regulation 7, covering Materials and Workmanship was heavily re-worked. CE marking of products is identified as a major way of establishing the fitness of materials for purpose. All manufacturers, installers and specifiers are urged to read this often neglected document. IFSA wants its Members to be at the forefront of the industry when it comes to the implementation of the CPR (Construction Product Regulations) and the associated requirement to apply the CE mark, when it is implemented in July 2013. To this end, it held a second Workshop on behalf of its Members to review the current state of play in respect of the hurdles which have to be overcome by manufacturers and factors if they are to meet the CPR objectives by the beginning of July. The process leading to CE marking and compliance with the CPR are anything but clear and every forum held to clarify the situation, either from a European perspective, or nationally, gives out a different message. Certainly, the national regulators, or regulatory guidance, are not helping to clarify what is expected from the fire protection industry after this date and the industry is being left to find its own solutions. The IFSA Workshop was a forum where the Members shared the information which they had gleaned from reading, or from meetings and seminars held by related Associations and it soon became obvious that IFSA Members were among the best informed as to what the future direction should be. The Workshop reviewed the current status of EN product standards (hEN’s) and the European technical approvals that are critical to the CE marking process. IFSA plotted a route map for its Members so that individual companies and the associated IFSA committees can contribute to the completion of any documents which were identified as barriers to the completion of the process. Once these barriers have been removed, the IFSA Members will be amongst the first to be able to offer CE marked products across Europe. 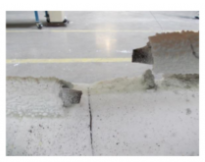 Approximately 10 years ago, IFSA realised that whilst the EN Fire Resistance test for penetration sealing materials was a good harmonised tool for comparing product A with product B under identical pan-European conditions, the test only generated a pass/fail result. The standard configurations given in the test procedure were very complex (and, hence, expensive to perform) but failed to generate data which characterised the product and its mechanism of performance in a manner that could be used to establish the interpolation and extrapolation of the result. The performance of a sealing system is interdependent on many factors; the width of the gap around the service, the depth of the sealant, the conductivity of the penetrating service, the thermal inertia and perimeter length of the service (similar to the Hp/A used for steelwork protection) and the thermal characteristics of the supporting construction and these all influence the duration for which the penetration could be sealed. The test standard EN 1363-1 test failed to generate data that could be used to calculate how one result can be applied to a different arrangement of service and/or penetration opening and this prompted the IFSA/ISO representatives to hold a brainstorming system (Paul Baxter & Peter Jackman) to come up with a more quantifiable method of test. By utilising well selected, simulated services and penetration with well-defined dimensions, it was possible to generate a known relationship between the conductor characteristics and the wall/floor construction. IFSA Technical Committee then developed a new test method that allowed a performance to be generated linking these together. This draft was submitted to ISO TC92/SC2/WG6 and has evolved, during the intervening years and via numerous drafts, to eventual submission for comment and voting to the national standards’ bodies of the ISO member states, e.g. Japan, Korea, USA, Canada, Hungary, UK etc., to reach publication stage as an ISO TR (Technical Report). This Autumn’s meeting in San Antonio saw the standard (ISO TR 10295: Part 3) finally go forward for publication. Whilst the Technical Report has no direct application to the CEN member states in the context of CE marking, the method will allow International Certification bodies to derive field of application reports in a co-ordinated and harmonised manner and, hopefully, with a greater relationship to ‘real-fire’ behaviour than the CEN tests would allow. It was ironic that after nurturing the new test procedure from the very first conceptual draft, Paul Baxter, IFSA’s nominated expert on the ISO penetration sealing committee, was not present in the USA to see the final act due to inadequacies in the UK’s funding position. However, IFSA was well represented at the meeting by Ian Bradley of AkzoNobel, one of the Association’s recent recruits, who ensured that the draft went through to the final sage without a hitch! The Regulatory Reform Order (RRO) which caused the introduction of new risk based fire safety controls as of October 1st 2006 has changed the way in which we achieve safe premises in a very important way. Prior to this date, most buildings that were occupied for commercial purposes operated under a Fire Certificate issued under the Fire Precautions Act of 1971, which was audited occasionally by the Fire Service to ensure compliance with the Certificate requirements. This Fire Certificate carried with it a ‘statutory bar’ that prevented any premises owner from having to upgrade his properties solely because primary legislation or its guidance had changed. The major change in adopting a risk based fire safety strategy is that the statutory bar has now been broken. A Risk Assessor will make up his or her own mind as to whether the building is safe in the way it is being used and will not necessarily be guided by compliance with the Codes that were in existence when the building was first approved. This means that the Risk Assessor has to be certain that people will evacuate the building safely should there be a fire event. Up until now these Risk Assessors have been provided with very little information as to how fire doors, penetration seals, and fire resisting glazing influences the tenability of the protected spaces in that building and how they should be assessed. These components are critical if one is to ensure the life safety of persons in and around the building. For the first time ever the Intumescent Fire Seals Association (IFSA) has produced Guidance Notes solely for use by any Risk Assessor working under the RRO to enable him/her to come to a rational decision as to whether the construction being audited compromises life safety or not. Risk Assessors would not have appreciated that a fire resisting door that was incorporated when the building was turned into its current use, possibly in the late 1970’s, early 80’s would probably only achieve half of it’s recommended fire resistance if it were to be adjudged by today’s standards. Similarly, the impact of smoke production or smoke leakage has never fully been able to be quantified by a Risk Assessor.